OTTAWA - When Stephen Harper arrives in Panama on Friday it will bring him within a short drive of a man he'd probably rather forget: alleged fraudster Arthur Porter. For his part, Porter, who's been jailed in Panama City for nearly two years, still thinks about the man who made him a member of Canada's spy watchdog a few years ago. He also has a message for Harper. Porter told The Canadian Press in a recent phone interview from La Joya prison that he wouldn't mind a visit from Harper while the prime minister is in the region this weekend for the Summit of the Americas. "If he wishes, he is most welcome to come and see the conditions that I live in now," Porter said of Harper during the conversation, which was drowned out at times by the shouts of other inmates in the background. "The (prison) air is the same, the infections are the same, the difficulties in finding water and food are the same. You know, some days are better than others." Porter has been detained since May 2013 in the Central American country as he fights extradition to Canada. He faces fraud charges in Canada related to a $1.3-billion hospital project in Montreal. It has been a long fall from grace for a man who won the trust of many high-level Canadian officials and politicians, including Harper. Harper has faced criticism for choosing Porter as well other past appointments, including now-suspended senators Mike Duffy, Patrick Brazeau and Pamela Wallin, who are all in trouble over expense claims. The prime minister named Porter in 2008 to the Security Intelligence Review Committee, which monitors the Canadian Security Intelligence Service. In joining SIRC, Porter was also sworn to the Privy Council and he remains a member. Porter was elevated to SIRC's chair two years later but resigned in December 2011 following published reports of his business links to an international arms dealer. After moving to the Bahamas, he was arrested along with his wife, Pamela, during a flight layover in Panama. Since his arrest, he claims he's had no contact "whatsoever" with Canadian authorities and has yet to have a court hearing in Panama. Still, the Sierra Leone-born doctor says he would rather stay in the prison and fight extradition than return to Canada, a country where he now mistrusts authorities. "I don't think I have a level playing field in Canada and I certainly am not interested in getting penalized for something that I am not guilty for," said Porter, who is a cancer specialist. Before his arrest two years ago, Porter revealed he was suffering from stage four lung cancer and likely had three months to live. He credits his survival to treatments he says knocked the cancer into remission. But he fears the disease is re-emerging and was recently told by friend Dr. Karol Sikora that he may only have six weeks to six months left. "I am still a tremendous optimist," Porter said through a muffled, raspy voice. "Of course, being an oncologist, I also know the score." Foreign Affairs spokesperson Ashley McArthur said Porter has been offered consular visits and medical help, but has refused both. "Canada is seeking Mr. Porter's extradition to Canada to face the charges against him. Canadian officials have scheduled consular visits with Mr. Porter on several occasions; however he has chosen not to attend," McArthur said in an email. "Canadian officials have also consistently supported access to medical treatment, which Mr. Porter has declined. Consular officials will continue to provide assistance to Mr. Porter, as they would for any Canadian." Sikora, who ran a cancer clinic with Porter in the Bahamas, based his estimate on email conversations with his friend and has not examined him in person. The U.K. physician also wrote an email last week to Harper, urging him to raise Porter's situation with Panamanian officials while he's in the country. "It is just amazing that this sort of human rights abuse of all prisoners not just Arthur can occur today in a civilized country," Sikora wrote in the email to Harper, which he forwarded to The Canadian Press. 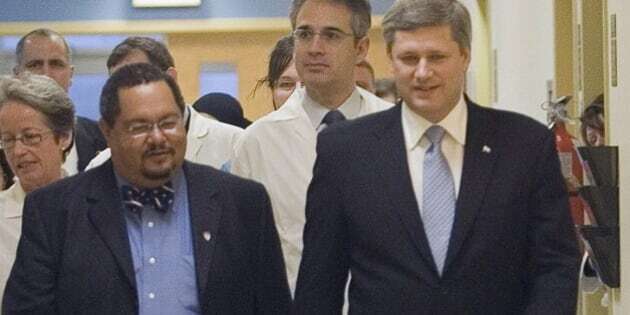 Sikora, who also sent Harper some of Porter's medical records, said the jailed physician was in urgent need of scans, tests and a new course of treatment. Aside from the invitation to visit him in jail, Porter said he doesn't have any specific message for Harper, who will meet with hemispheric leaders at the summit on Friday and Saturday. He hopes someone will ensure he gets access to adequate medical care and speed up his legal process. Porter feels his case got a boost following a recent report by the United Nations special rapporteur on torture. The brief UN report said that Porter is being held in degrading and inhuman conditions and has been denied medical treatment. "I am here not at the request of Panama, but at the request of Canada," Porter said. "They need to know the conditions that led to the UN finding that was against the convention against torture." His frustration, he added, is not directed at Harper himself. "I'm not unhappy about the man, but I am certainly unhappy about the government."